With China's second aircraft carrier widely expected to join the People's Liberation Army (PLA) Navy this year, the recruitment campaign is designed to ensure personnel to meet the needs of the aircraft carrier-borne fighter jet J-15. This year's physical exams added a series of tests that pilots of carrier-borne aircraft need to pass including vision and auditory tests on candidates' vestibular function, corneal topography and stereovision, the report said. More than 4,500 students who passed enrollment exams will participate in the next phase, the report said. During the same recruitment campaign last year, about 2,600 students made it to the comprehensive examination phase, according to the recruitment campaign's website. That number was then cut to 800 before the final selection. It is unknown how many were eventually enrolled in last year's cadet pilot program. 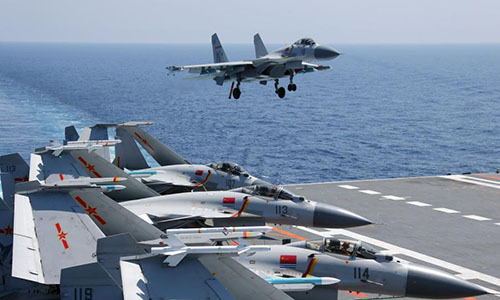 While the Liaoning and the Type 001A, China's first and second aircraft carrier, can each carry about 30 fighter jets, future carriers may be designed to carry more than 60, a Beijing-based military expert, who asked not to be named, told the Global Times on Monday. More pilots than fighter jets are needed to ensure an aircraft carrier's full combat capability, the expert said, noting that not all students who pass the examinations can become pilots capable of flying carrier-borne fighter jets which is a job that comes with "extremely high difficulty." Looking to the future, future carriers are expected to be equipped with an electromagnetic catapult to launch aircraft instead of the conventional jump-rack deck. The new technology allows heavier aircraft to take off. China's next generation stealth fighter jet FC-31 and airborne early warning aircraft KJ-600 are likely to be part of the new carriers' fleet of aircraft, experts said. Li Jie, a Beijing-based naval expert, told the Global Times that China will develop a new set of training methods as the technology and equipment make the shift in the coming years. Talented pilots who have mastered the J-15 may also learn to fly new aircraft, Li noted.